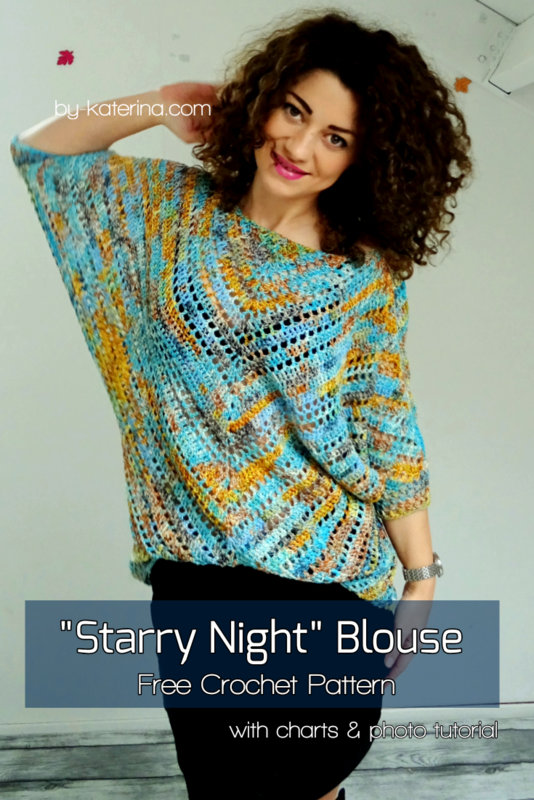 This beautiful “Starry Night” Blouse was supposed to be made with another yarn. Off course that if I would have used it another type of yarn the name wouldn’t be the same. After I noticed that the yarn I had wasn’t enough for the project, I had to started all over using another yarn. Wow, and I am glad I did so! 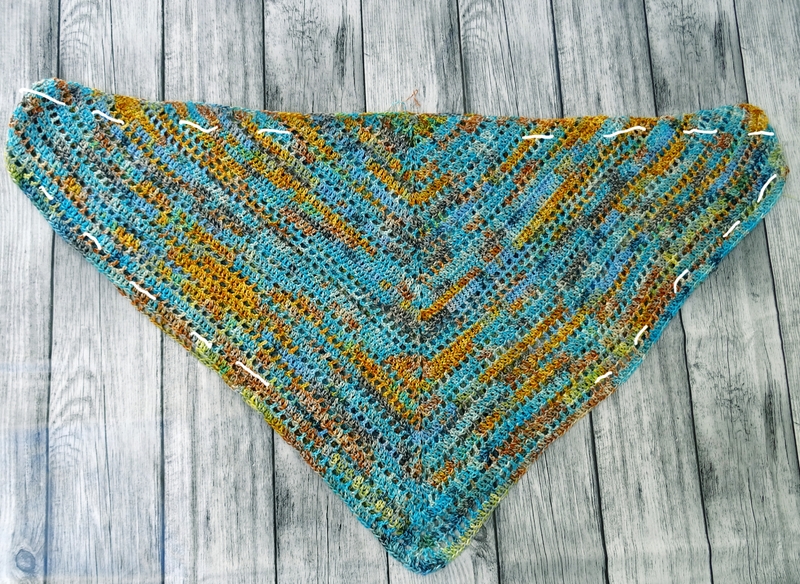 The colors reminded me of Vincent van Gogh paintings, after just a few rows, but the name was suggested by @jane_love_knit, who commented on the first photo I posted that the colors reminds her of “Starry Night” painting of the artist. “What a wonderful name”, I said and voila: My latest pattern, The “Starry Night” Blouse. Isn’t it just gorgeous? I don’t know, but lately I have ideas only for summery designs, but I think is not that bad since we all are impatient for warmer days. 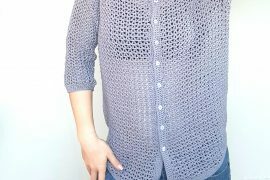 When I first thank at this shape of blouse, I said that it will be a perfect garment project to try, for those of you who didn’t experiment this garments field of crocheting. Why? 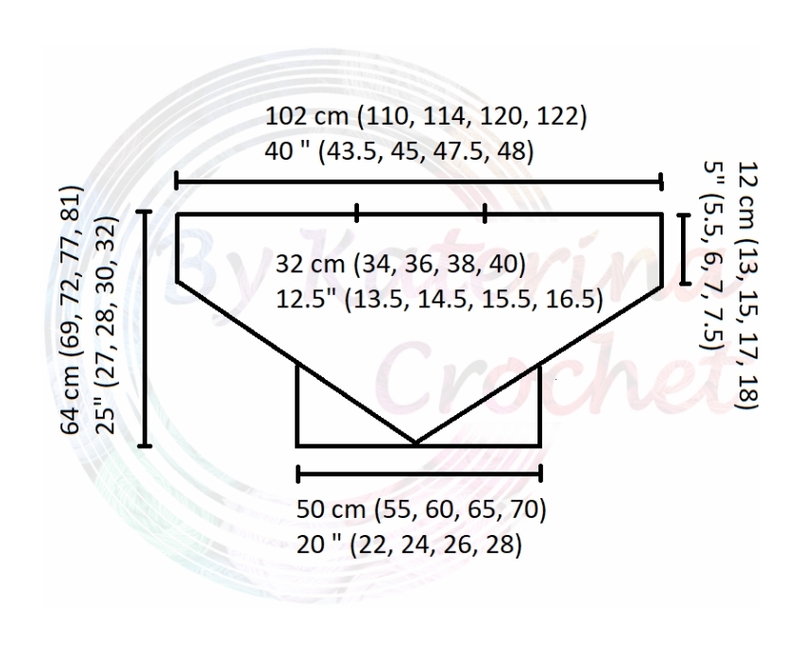 Because the main parts of the blouse are 2 triangle scarfs that are joined together and then we will add 2 triangles to complete the edges and to make the bottom of the blouse straight. When working at the triangle panel, at some point we will stop increasing at the beginning and at the end of the row to make the ends of the sleeves straight. You can start with the straight edges when you get to the desired width (measuring from the neck to the end of the sleeve, depending on how long you want the sleeves to be ). Pay attention that working on the width you will also work on the length of the “Starry Night” Blouse. The sleeves can be made longer by adding at the end a few rounds. I used Lana Grossa Papaggallo. It’s 50% Cotton, 50% Microfiber and is a light weight, yarn. 1 Ball of yarn has 100 grams, 340 m/372 yds. 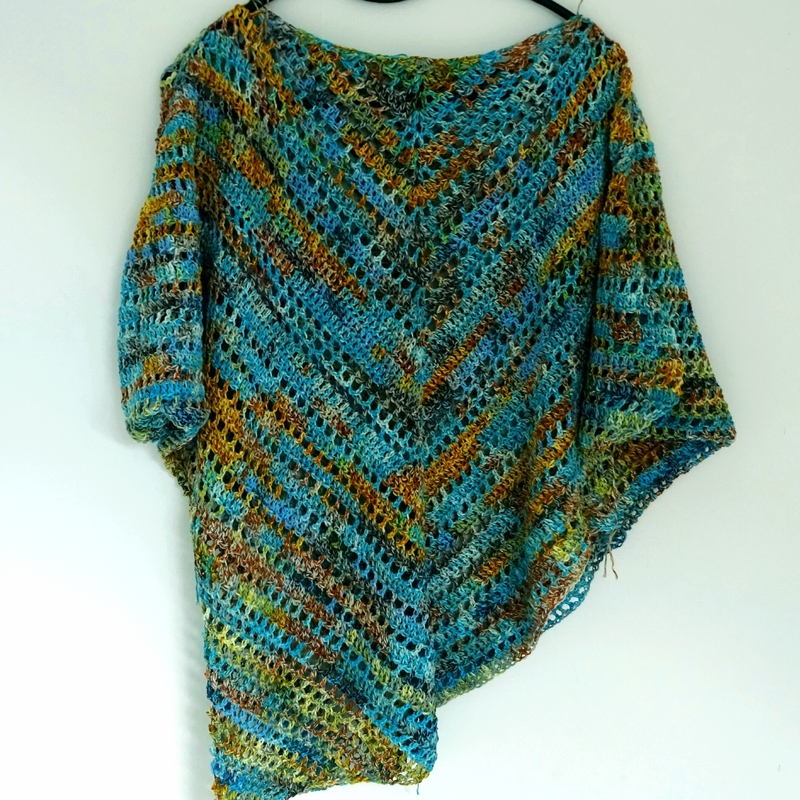 The pattern is available for sizes from S to 2X Large and is written in US terms. The final measurements are represented in the diagram bellow. On the first line are values in Centimeters and on the second one in inches. *the measurements above can be adjusted. For example if you want the blouse to be shorter you can make less rows on the main triangle, and extend at the end the sleeves if needed. *I made the back panel only in filet stitch (1 dc, ch 1, 1 dc). If you are using the same pattern as for the front, 1 row in dc, 1 row in filet stitch you might need a more yarn. I used simple stitches for the pattern. 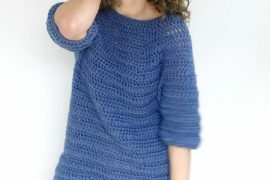 The main stitch pattern is one row in double crochet, 1 row in filet stitch. Along the first panel I just played with the pattern and made some more rows in double crochet and more rows in filet stitch. For the back I used only filet stitch. So, be free to play with the pattern and make it your own. 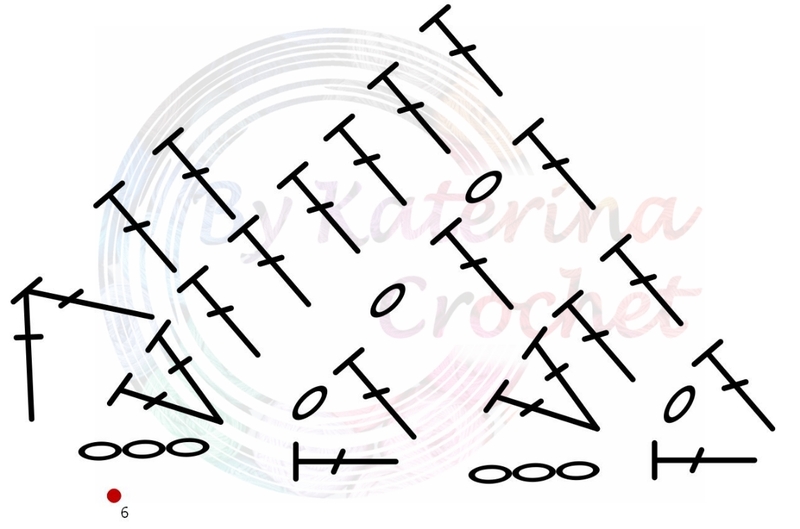 Increase end: 3 dc in the 3rd st of the starting chain, for the dc rows, and (1 dc, ch 1, 1 dc) in the 3rd st of the starting chain for windows rows. The skill level required for the “Starry Night” Blouse pattern is easy so, don’t be afraid to try it. Like I said in the pattern description, we will work 2 identical panels, front and back. Start with ch 4 and slip stitch to join the ends and make a circle. Ch 3, 2 dc in the 1 st stitch, 1 dc in each st until you get to the center point (the chain 2 space). Inc middle (2 dc, ch 2, 2 dc) in the ch 2 space. Continue with 1 dc in each st until you get to the last one. Inc end in the last st (3 dc in the last stitch). Well after finishing these rows the one panel of the “Starry Night” Blouse has to look as a triangle scarf. Next, we will have to stop increasing at the beginning and at the end of the rows and start decreasing so the edges to be straight. 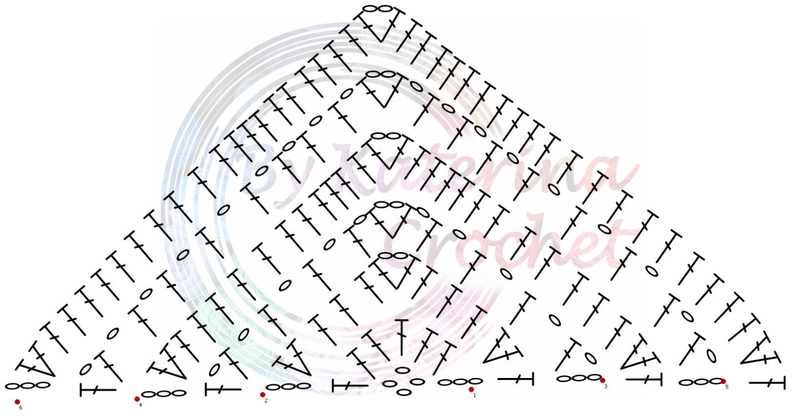 In the stitch charts bellow you can see in symbols how we make the decreases. We will keep working a few more rows just until now. Only that the rows will start and end different. For each kind of row, in dc or window row, the beginning and the end will be the same. Ch 3, skip 1 st, 1 dc in next, continue with the st pattern to to Center Point, inc middle, continue with the st pattern until you have 3 sts left. 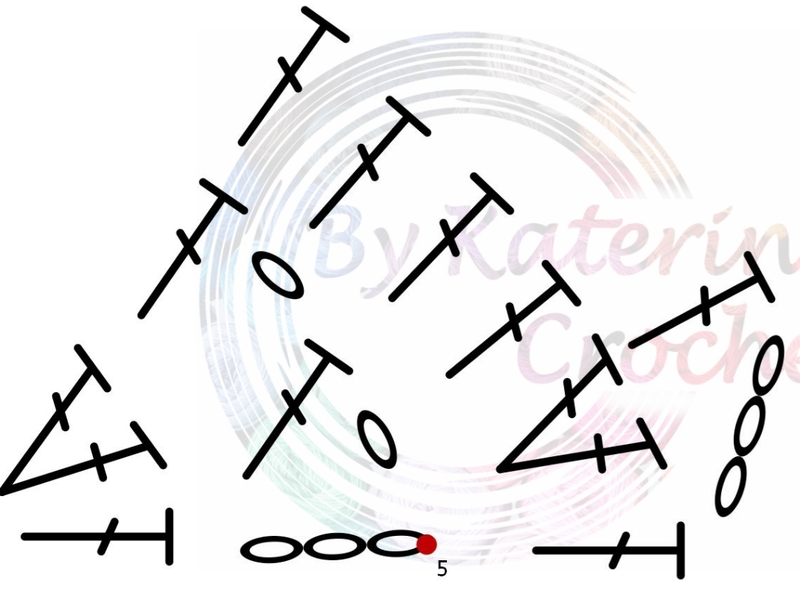 In the last 3 sts make the decrease end (1 partial dc, skip 1, 1 partial dc, yarn over and pull the yarn trough all the loops on your hook. After completing these rows the panel is done and you have to make one more in the same way. When you have the 2 panels done, lay them one over the other. The first is with the right side facing you and the second is with the wrong side facing you. We will assemble them and we have to sew on the wrong side. To know how much we have to sew on the top part we have to mark the neck line. 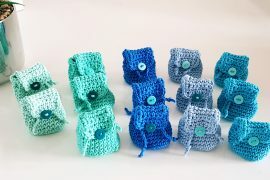 Use 2 stitch markers to be easier. Sew the sts before an after the st markers, letting the rounds in middle opened for the neck line . Then sew the remaining sts. After assembling we will work on the sides to make the bottom of the Starry Night Blouse straight. Each side will be worked separately. I worked the sides only in windows st. Decrease end: 1 partial dc, skip 1, 1 partial dc, yarn over and pull the yarn through all loops. Ch 3, skip 1, 1 dc in next, skip 4 st, 1 partial dc, skip 1, 1 partial dc. After completing the both sides the Starry Night Blouse is done. 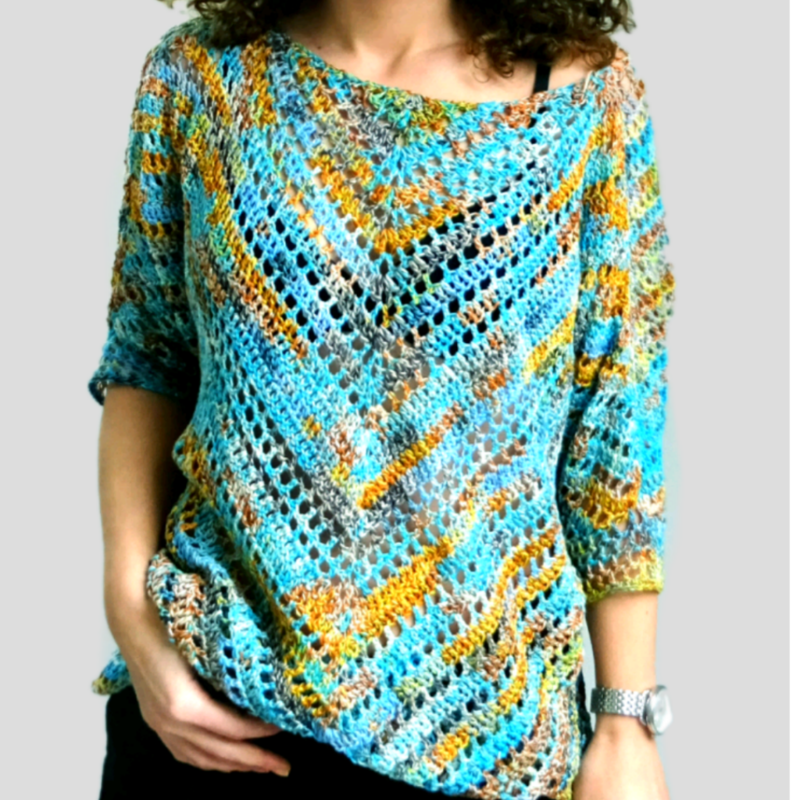 Make one row in single crochet or in different stitch pattern on the bottom of the Starry Night Blouse and on the neck line. if you want, you can make a few rounds on sleeves to make them longer. I made 4 rows in windows st.
Hope you liked the Starry Night Blouse pattern and you will make it. Can not wait to see your photos. Keep an eye here because other interesting patterns are about to come. Thanks for your pattern, this is the third pattern of yours I’m using. Just a question about working the sides, do you start from the pointy end (that is the front of the blouse) or the sides where the 2 panels were joined? I hope this makes sense. Thanking you in advance. Hi Katerina. Thanks for your pattern, this is the third one of yours I’m using. Hi Jenny. Thank you so much. I’m so glad you love my designs. You have to start the sides from the pointy end, middle of the blouse, where you increased to make the triangle shape. Thanks Katerina for your prompt response. So after you do the sides separately, do you see them together at the front and back?